At the moment Indian cuisine and Indian restaurants are trending in Dubai. I can’t be more happier as I love Indian food. In the last eight days I have visited three new Indian restaurants. 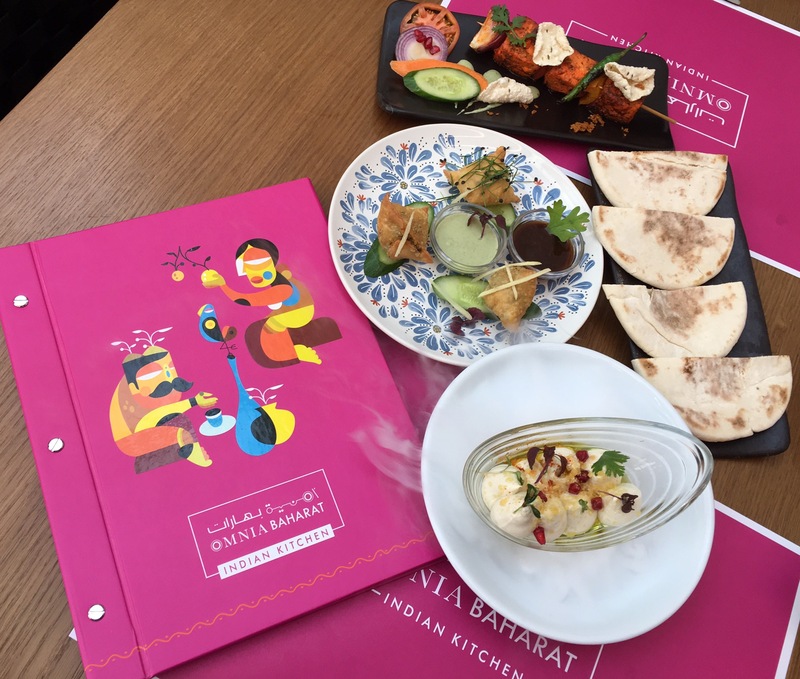 Omnia Baharat, the restaurant by celebrity chef and restauranteur Silvena Rowe unveiled a brand new look and an Indian inspired menu. I had the pleasure of attending the unveiling of their new look. And after that I decided to visit Omnia Baharat for a relaxed lunch yesterday. Silvena Rowe is a famous face on the BBC and on commercial television stations in the UK, a rotating judge on the top-rated US show Chopped, and her own highly acclaimed show in her homeland. This former Guardian columnist has cooked for famous celebrities at her London restaurant. She has also opened restaurants in Dubai. 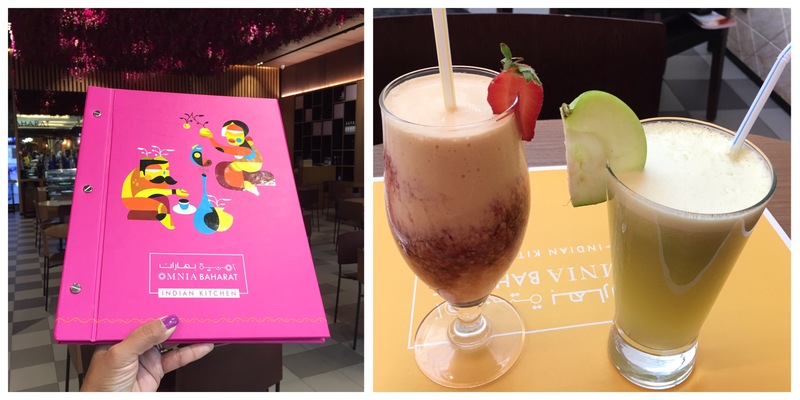 And Omnia Baharat is one of her restaurants that is located at Level 2 Expansion in Mall of the Emirates. As a chef, Silvena has always been interested in the various cuisines around the world. The eclectic mix of spices that add flavor and splendor to Indian cuisine has always enthralled her. At Omnia Baharat, Silvena showcases the fun side of great tasting Indian street food, prepared with handpicked quality ingredients in a typical Indian kitchen. The restaurant is spacious with an atrium seating area as well as indoor dining area. The atrium seating area has natural light where as the indoor area has a vibrant hanging floral garden. There is a spark of bright color everywhere from menu to the table mats, to colorful mural on the wall and the uniform of the staff. This touch of color adds to the beauty of the place. 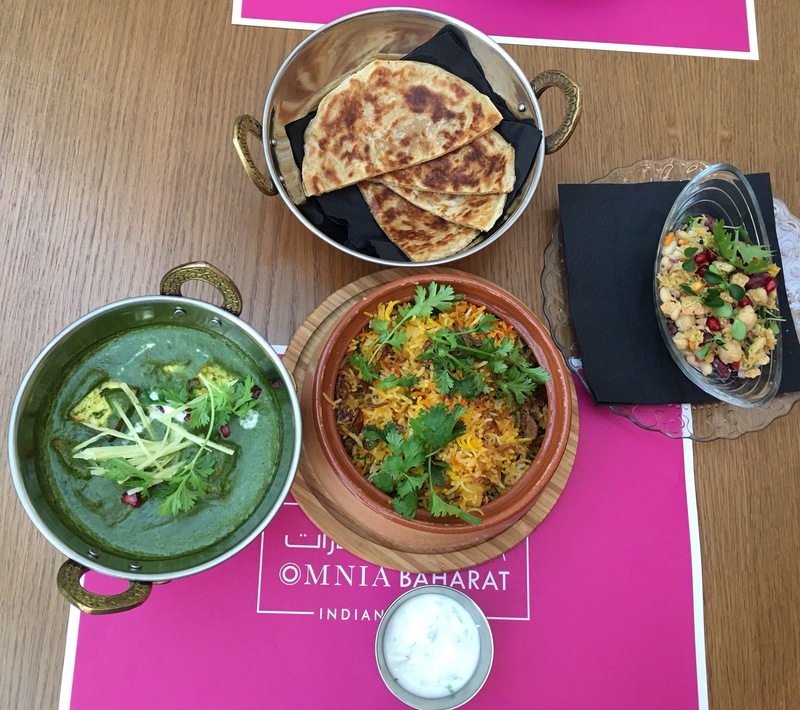 Omnia Baharat’s menu offers breakfast, lunch and dinner. They offer bits and bites in small plates, grills, curries, breads, biryani and desserts. Apart from that, the menu also offers non Indian dishes and desserts of Silvena. Huge variety of cold and hot beverages are also part of the menu. Kids also have a special menu. We started off with drinks first, we ordered Summer Punch which was a mix of tropical fruits. Though the drink was good, it was a bit heavy and too sweet. From their healthy drinks section, we ordered Omnia Heart Salvation, it had a blend of green apple, pineapple and ginger. This drink was not only healthy, it was delicious too. Bite sized potato and peas samosas were crisp and tasty. We loved their Vegetable Samosa. Paneer Tikka was soft and succulent. Soft cubes of Paneer was marinated in Tandoori masala and then grilled to perfection. It was served with mint chutney. Popping Hummus is a definite must-try. It had creamy velvety hummus sprinkled with popping crystals that go pop with every bite. It was served with fresh pita bread. Indian Mixed Bean Salad was crunchy and we loved the flavor of Chaat masala. Paneer Palak had rich and flavorful spinach cream gravy with soft pieces of paneer. Vegetable Biryani that we ordered was mildly spicy. It would have been better if it had more spice and flavor. All their biryanis come with a small bowl of Raita. The Tandoori Paratha that we ordered, didn’t have an authentic taste. 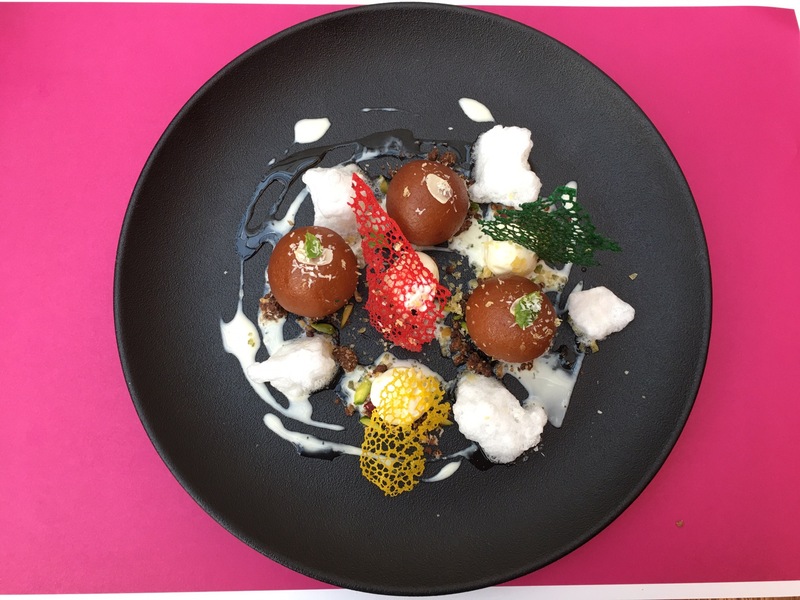 Omnia style classic Gulab Jamun was served with cardamom ice cream, garnished with raspberry, popping cookie crumble and cardamom cloud. Their Gulab Jamun is hands down my favorite Gulab Jamun in Dubai. It tasted heavenly and the plating was fantastic. 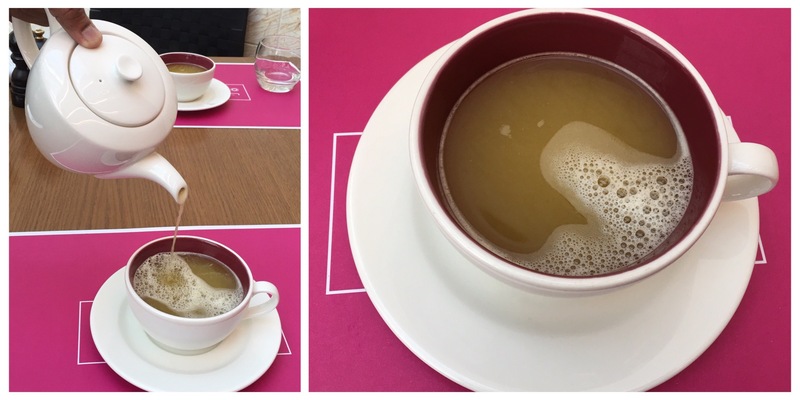 We ended our meal with a pot of Silvena’s Favorite Ginger Tea. I didn’t like the citrus mix in the tea and I felt like I had hot orange juice. 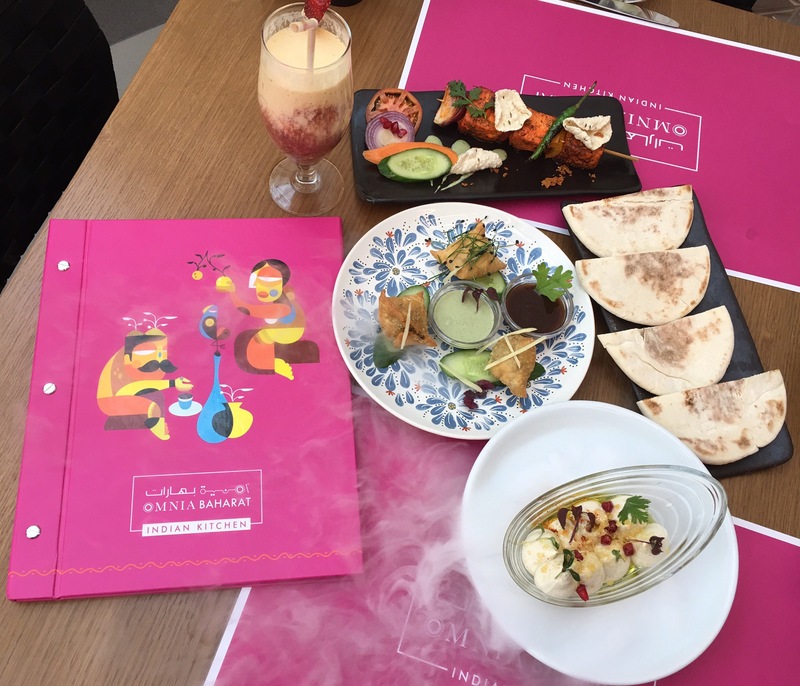 Overall, we enjoyed our lunch at Omnia Baharat. Some of the Indian dishes require a bit more spice and flavor, apart from that everything was perfect.